Important terminology in accounting includes cash vs. accrual basis, assets, liabilities, and equity. The cash basis of accounting records revenue when cash is received and expenses when they are paid in cash. The accrual method records income items when they are earned and records deductions when expenses are incurred, regardless of the flow of cash. Assets are economic resources. Anything capable of being owned or controlled to produce value is considered an asset. A liability is an obligation of an entity arising from past transactions, the settlement of which may result in the transfer of assets, provision of services, or other yielding of economic benefits in the future. Equity is the residual claim or interest of the most junior class of investors in assets after all liabilities are paid. There are two primary accounting methods – cash basis and accrual basis. The cash basis of accounting, or cash receipts and disbursements method, records revenue when cash is received and expenses when they are paid in cash. In contrast, the accrual method records income items when they are earned and records deductions when expenses are incurred, regardless of the flow of cash. Accrual accounts include, among others, accounts payable, accounts receivable, goodwill, deferred tax liability and future interest expense. The term accrual is also often used as an abbreviation for the terms accrued expense and accrued revenue. Accrued revenue (or accrued assets) is an asset, such as unpaid proceeds from a delivery of goods or services, when such income is earned and a related revenue item is recognized, while cash is to be received in a later period, when the amount is deducted from accrued revenues. An example of an accrued expense is a pending obligation to pay for goods or services received from a counterpart, while cash is to be paid out in a latter accounting period when the amount is deducted from accrued expenses. In financial accounting, assets are economic resources. Anything capable of being owned or controlled to produce value is considered an asset. Simply stated, assets represent value of ownership that can be converted into cash. Two major asset classes are intangible assets and tangible assets. Intangible assets are identifiable non-monetary assets that cannot be seen, touched or physically measured, are created through time and effort, and are identifiable as a separate asset. 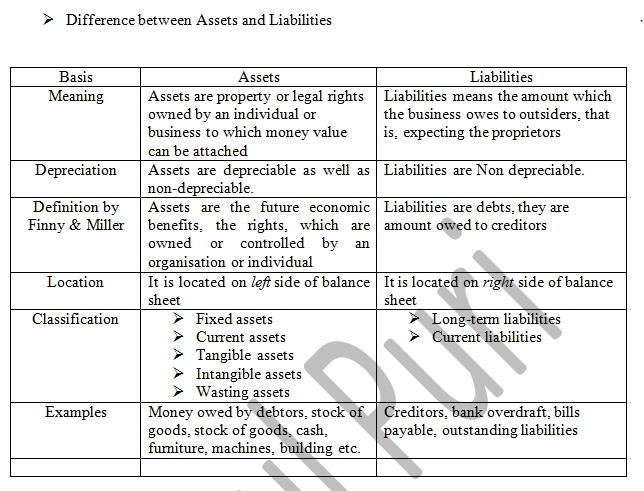 Tangible assets contain current assets and fixed assets. Current assets include inventory, while fixed assets include such items as buildings and equipment. In accounting and finance, equity is the residual claim or interest of the most junior class of investors in assets after all liabilities are paid. If liability exceeds assets, negative equity exists. In an accounting context, shareholders ‘ equity represents the remaining interest in assets of a company, spread among individual shareholders in common or preferred stock. Credit and debit are the two fundamental aspects of every financial transaction in the double-entry bookkeeping system. The English words credit and debit come from the Latin words credre and debere, respectively. Credre means “to entrust,” and debere means “to owe”. In financial accounting or bookkeeping, “Dr” (Debit) indicates the left side of a ledger account and “Cr” (Credit) indicates the right. The rule that total debits equal total credits applies when all accounts are totaled. 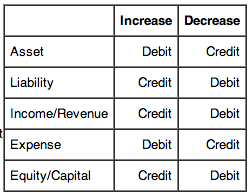 An increase (+) to an asset account is a debit. An increase (+) to a liability account is a credit. Conversely, a decrease (-) to an asset account is a credit. A decrease (-) to a liability account is a debit. It is important for us to consider perspective when attempting to understand the concepts of debits and credits. double-entry bookkeeping system: A double-entry bookkeeping system is a set of rules for recording financial information in a financial accounting system in which every transaction or event changes at least two different nominal ledger accounts. The difficulty with accounting has less to do with the math as it does with its concepts. There is no more difficult yet vital concept to understand than that of debits and credits. Debits and credits are at the heart of the double-entry bookkeeping system that has been the foundation stone on which the financial world’s accounting system has been built for well over 500 years. Given the length of time, is it any wonder that confusion has surrounded the concept of debits and credits? The English language and its laws have morphed to bring new definitions for two words that, in the accounting world, have their own significance and meaning. For a better conceptual understanding of debits and credits, let us look at the meaning of the original Latin words. The English translators took theirs word credit and debit from the Latin words credre and debere, respectively. Credre means “to entrust,” and debere means “to owe. ” When we look closely into these two concepts we see that they are actually two sides of the same coin. In a closed financial system, money cannot just materialize. If money is received by someone it must have come from someone. That is, if someone entrusts an amount of money to someone else, then that person receiving the entrusted money would owe the same amount of money in return (i.e., the credre must equal the debere). Debits and credits serve as the two balancing aspects of every financial transaction in double-entry bookkeeping. 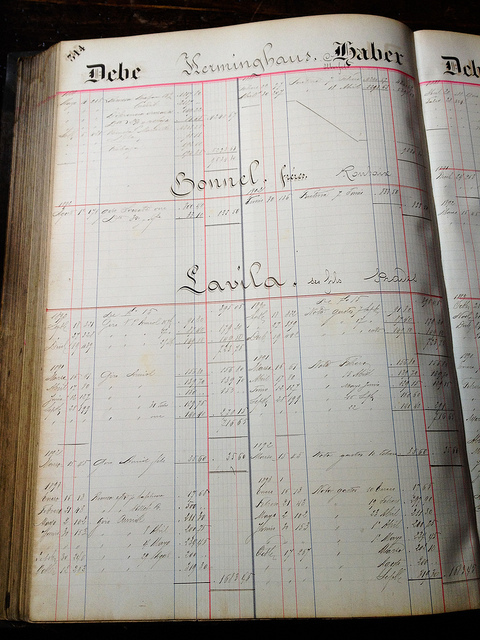 Debits are entered on the left side of a ledger, and credits are entered on the right side of a ledger. Whether a debit increases or decreases an account depends on what kind of account it is. In the accounting equation Assets = Liabilities + Equity, if an asset account increases (by a debit), then one must also either decrease (credit) another asset account or increase (credit) a liability or equity account. Another way to help remember debit and credit rules, is to think of the accounting equation as a tee (T), the vertical line of the tee (T) goes between assets and liabilities. Everything on the left side (debit side) increases with a debit and has a normal debit balance; everything on the right side (credit side) increases with a credit and has a normal credit balance. (Note: a normal balance does not always mean the accounts balance will be on that side, it’s simply a way of remembering which side increases it). Accounting Equation: The extended accounting equation allows for revenue and expenses as well. Revenue is treated like capital, which is an owner’s equity account, and owner’s equity is increased with a credit, and has a normal credit balance. Expenses reduce revenue, therefore they are just the opposite, increased with a debit, and have a normal debit balance. Each transaction (let’s say $100) is recorded by a debit entry of $100 in one account, and a credit entry of $100 in another account. When people say that “debits must equal credits” they do not mean that the two columns of any ledger account must be equal. If that were the case, every account would have a zero balance (no difference between the columns), which is often not the case. The rule that total debits equal the total credits applies when all accounts are totaled. It is important for us to consider perspective when attempting to understand the concepts of debits and credits. For example, one credit that confuses most newcomers to accounting is the one that appears on their own bank statement. We know that cash in the bank is an asset, and when we increase an asset we debit its account. Then how come the credit balance in our bank accounts goes up when we deposit money? The answer is one that is fundamental to the accounting system. Each firm records financial transactions from their own perspective. Think about the bank’s perspective for a moment. How do they view the money we have just deposited? Whose money is it? It’s ours; therefore, from the bank’s perspective the deposit is viewed as a liability (money owed by the bank to others). When we deposit money into our accounts, the bank’s liability increases, which is why the bank credits our account. In summary: An increase (+) to an asset account is a debit and an increase (+) to a liability account is a credit; conversely, a decrease (-) to an asset account is a credit and a decrease (-) to a liability account is a debit. To ensure that a company is “in balance,” its assets must always equal its liabilities plus its owners’ equity. The accounting equation displays that all assets are either financed by borrowing money or paying with the money of the company’s shareholders. The balance sheet is a complex display of this equation, showing that the total assets of a company are equal to the total of liabilities and shareholder equity. Any purchase or sale has an equal effect on both sides of the equation or offsetting effects on the same side of the equation. A mark in the credit column will increase a company’s liability, income, and capital accounts but decrease its asset and expense accounts. A mark in the debit column will increase a company’s asset and expense accounts, but decrease its liability, income, and capital account. The fundamental accounting equation can actually be expressed in two different ways. A double-entry bookkeeping system involves two different “columns;” debits on the left, credits on the right. Every transaction and all financial reports must have the total debits equal to the total credits. A mark in the credit column will increase a company’s liability, income and capital accounts, but decrease its asset and expense accounts. A mark in the debit column will increase a company’s asset and expense accounts, but decrease its liability, income and capital account. For example, if a person buys a computer for $945. He borrows $500 from his best friend and pays for the rest using cash in his bank account. To record this transaction in his personal ledger, the person would make the following journal entry. An extension of that basic rule involves the balance sheet. The total assets listed on a company’s balance sheet must equal the company’s total liabilities, plus its owners’ equity in the company. This identity reflects the assumption that all of a company’s assets are either financed through debt or through the contribution of funds by the company’s owners. Preparing financial statements requires preparing an adjusted trial balance, translating that into financial reports, and having those reports audited. The purpose of financial statements are to provide both business insiders and outsiders a concise, clear picture of the current financial status in the business. Therefore, the people who use the statements must be confident in its accuracy. Closing the books is simply a matter of ensuring that transactions that take place after the business’s financial period are not included in the financial statements. Adjusting entries are generally made in relation to prepaid expenses, prepayments, accruals, estimates and inventory. When an audit is completed, the auditor will issue a report regarding whether the statements are accurate. To ensure a positive reports, some companies try to participate in opinion shopping. This practice is generally prohibited..
opinion shopping: The process of contracting or rejecting auditors based on the type of opinion report they will issue on the auditee. adjusting entry: Journal entries usually made at the end of an accounting period to allocate income and expenditure to the period in which they actually occurred. When a business enterprise presents all the relevant financial information in a structured and easy to understand manner, it is called a financial statement. The purpose of financial statements are to provide both business insiders and outsiders a concise, clear picture of the current financial status in the business. Therefore, the people who use the statements must be confident in its accuracy. The process of preparing the financial statements begins with the adjusted trial balance. Preparing the adjusted trial balance requires “closing” the book and making the necessary adjusting entries to align the financial records with the true financial activity of the business. Closing the books is simply a matter of ensuring that transactions that take place after the business’s financial period are not included in the financial statements. For example, assume a business is preparing its financial statements with a December 31st year end. It acquires some property on January 14th. If the books are properly closed, that property will not be included on the balance sheet that is being prepared for the period on December 31st. An adjusting entry is a journal entry made at the end of an accounting period that allocates income and expenditure to the appropriate years. Adjusting entries are generally made in relation to prepaid expenses, prepayments, accruals, estimates and inventory. Throughout the year, a business may spend funds or make assumptions that might not be accurate regarding the use of a good or service during the accounting period. Adjusting entries allow the company to go back and adjust those balances to reflect the actual financial activity during the accounting period. For example, assume a company purchases 100 units of raw material that it expects to use up during the current accounting period. As a result, it immediately expenses the cost of the material. However, at the end of the year the company discovers it only used 50 units. The company must then make an adjusting entry to reflect that, and decrease the amount of the expense and increase the amount of inventory accordingly. The company may also provide Notes to the Financial Statements, which are disclosures regarding key details about the company’s operations that may not be evident from the financial statements. Financial statement: Financial statement from Wachovia National Bank, 1906. Once the company prepares its financial statements, it will contract an outside third party to audit it. An audit is an independent review and examination of records and activities to assess the adequacy of system controls, to ensure compliance with established policies and operational procedures, and to recommend necessary changes in controls, policies, or procedures. It is the audit that assures outside investors and interested parties that the content of the statements are correct. When an audit is completed, the auditor will issue a report with the findings. The findings can state anything from the statements are accurate to statements are misleading. To ensure a positive reports, some companies try to participate in opinion shopping. This is the process that businesses use to ensure it gets a positive review. Since Enron and the accounting scandals of the early 2000s, this practice has been prohibited. Transactions include sales, purchases, receipts, and payments made by an individual or organization. Sales – A sale is a transfer of property for money or credit. Revenue is earned when goods are delivered or services are rendered. In double-entry bookkeeping, a sale of merchandise is recorded in the general journal as a debit to cash or accounts receivable and a credit to the sales account. Purchase transactions results in a decrease in the finances of the purchaser and an increase in the benefits of the sellers. Purchases can be made by cash or credit. As credit purchases are made, accounts payable will increase. Receipts refer to a business getting paid by another business for delivering goods or services. This transaction results in a decrease in accounts receivable and an increase in cash/ cash or equivalents. Payments refer to a business paying to another business for receiving goods or services. This transaction results in a decrease in accounts payable and an decrease in cash/ cash or equivalents. double-entry bookkeeping: A double-entry bookkeeping system is a set of rules for recording financial information in a financial accounting system in which every transaction or event changes at least two different nominal ledger accounts. Transactions include sales, purchases, receipts, and payments made by an individual or organizations. A sale is a transfer of property for money or credit. Revenue is earned when goods are delivered or services are rendered. In double-entry bookkeeping, a sale of merchandise is recorded in the general journal as a debit to cash or accounts receivable and a credit to the sales account. The amount recorded is the actual monetary value of the transaction, not the list price of the merchandise. A discount from list price might be noted if it applies to the sale. Fees for services are recorded separately from sales of merchandise, but the bookkeeping transactions for recording sales of services are similar to those for recording sales of tangible goods. Purchasing refers to a business or organization acquiring goods or services to accomplish the goals of its enterprise. This transaction results in a decrease in the finances of the purchaser and an increase in the benefits of the sellers. Purchases can be made by cash or credit. As credit purchases are made, accounts payable will increase. Receipts refer to a business getting paid by another business for delivering goods or services. This transaction results in a decrease in accounts receivable and an increase in cash or equivalents. Payments refer to a business paying another business for receiving goods or services. The business that makes the payment will decrease its accounts payable as well as its cash or equivalents. On the other hand, the business that receives the payment will see a decrease in accounts receivable but an increase in cash or equivalents.